Stock your kitchen's cleaning supply with these 100 gram, heavy weight scouring pads! Made of coiled stainless steel, these reusable pads are rust- and corrosion-resistant, lasting you through multiple heavy duty cleanings. Each pad's rough surface makes it perfect for removing even the toughest, baked-on food and grease stains from your pots and pans. From caked-on ziti to other burnt-on food particles, grease and residue, these scouring pads will cut down your staff's cleaning time and effort. They can also be used on other various surfaces. From cook tops to grills, these pads are versatile cleaning agents! Their heavy weight also makes them ideal for heavier, tougher uses. These heavy weight scouring pads are of excellent quality! They hold up really well and scrub cast iron well. They were bigger than I was expecting but I am not disappointed! Love these! Our customers love that this is a recyclable option. We love that you can get pretty much any stain out. It's easy to clean when you have one of these! These stainless steel scrubbers are great, they are huge and work well to hold a fair amount of water- almost like a stainless steel sponge. Best value out there IMHO for scouring pads. Way more expensive to buy these local and we get many uses out of them. Definitely a good buy. Great for cleaning grills, griddled,pots, pans and almost anything that is hard to clean in the kitchen. Will last for a lot of cleans. Just rinse them Out and use again. These stainless steel scouring pads are very large! They make it very easy to clean up almost any mess you make in the kitchen, especially thicker, greasier ones. I bought a whole case of these for my small restaurant and they work great. I haven't used a lot of them because they last a long time. Really like this pad, It cleans my dishes really good. It doesn't wear out fast for how much i use it. Great quality and good price. 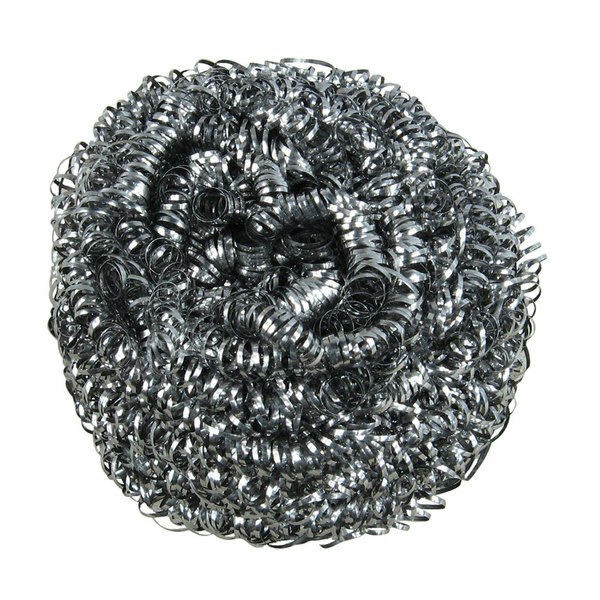 The stainless steel scouring pad is a heavy weight type pad and makes cleaning tough messes super easy. The scouring pad is strong and does an excellent job on cleaning cast iron pans. THESE ARE VERY NICE SCOURING PADS, WITH A DECENT STRENGTH TO THEM . THEY WORK VERY WELL FOR SCRUBBING THE BOTTOMS OF POTS AND PANS,DON'T USE ON NON STICK! The scouring pads worked great! Our dishwasher loved it the moment he started using it. It was a good quality scouring pad overall. They last long also. Love these heavy weight scoring pads for cleaning the grill griddle. A nice tool to have and really does a great job without having to put to much force behind. Great buy. Perfect for cleaning pots/pans and grills at your restaurant! Pricing is always great with webstaurantstore, would purchase this pack over and over again! Long lasting material. Great quality at a great price. Customers rave about how much better they are than standard scouring pads. If you want to save time and energy I highly recommend this product.